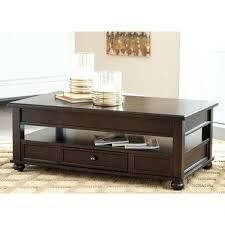 Item Description: It's all about smart organization and keeping everything easily within reach with the traditional styled Barilanni lift top coffee table. Its compact design is defined with the open middle shelf, lower drawer and hidden storage compartments found under the lift top. Because the top springs forward, this table can easily be accommodating for dinners in front of the TV or setting up a mobile workspace. 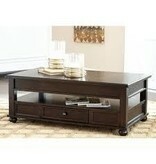 Series Features: Made with Mindi veneers and select hardwood solids in a rich dark brown finish. Cocktail table has lift top with hidden storage and one storage drawer. Chair side end table has closed storage behind a large door and an AC power supply with (2) USB charging ports. Hardware features round metal knobs in a dark bronze color finish.